The IITA Youth Agripreneurs in Abuja have conducted a five-day step down training in IITA Abuja Station on Monday. The training is being organized by the Agripreneurs themselves for themselves—the few Agripreneurs who attended the just-concluded Ekimiks 2016 training program titled “Developing Strategic Skills for Agribusiness” at IITA headquarters in Ibadan are cascading it down to the majority of those who could not attend. 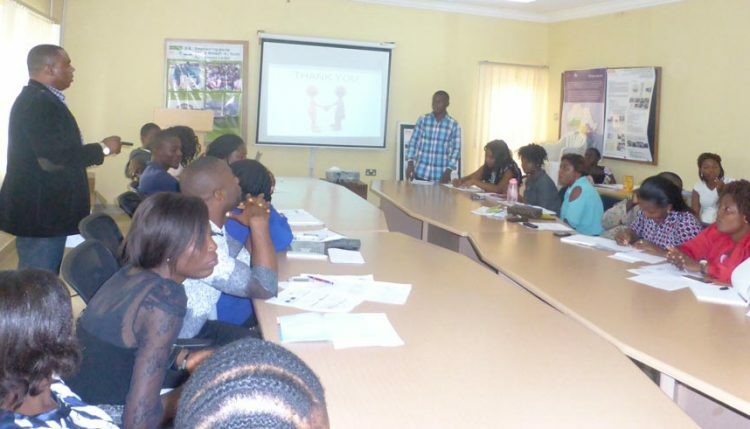 IITA Youth Agripreneurs in Abuja conduct training on agribusiness for fellow Agripreneurs. The training aimed at improving the capacity of the Agripreneurs in critical areas of their agricultural activities such as, effective planning for sustainable farming business, fundamentals of business accounting, business performance ratios, winning business plans for agribusiness, essential business skills in farm management, managing personpower for high productivity, achieving operational excellence, writing, public speaking and presentation skills, effective sales and marketing solutions, risk management, and business continuity planning, among others. Declaring the training open, the Abuja Head of Station, Gbassey Tarawali thanked those who organized the training, and encouraged those who didn’t go to Ibadan to take advantage of the training to enrich their knowledge in preparation for the planting season. He pledged his full support and that of other staff in making the training a success.